On a dark, stormy night you are laying awake in your bed. You feel as if someone, or something is watching you from the recesses of your room. Your heart starts to race with an irregular beat. An irrational dread gnaws at your brain. Your hands start to tremble and then shake uncontrollably. You have a sudden urge to use the bathroom. You crawl from between the covers and start stumbling for the bedroom door when your feet pull you toward the closet instead. Your palm begins to sweat as your hand, against your will, reaches for the doorknob. As you turn the knob, a ghostly chill races up and down your spine. The door swings open and you look into the huge glistening eye of a hideous monster composed of severed body parts. You black out before the scream escapes your throat?It is a good thing that you are unconscious because you become an unwilling organ donor to Transplant! 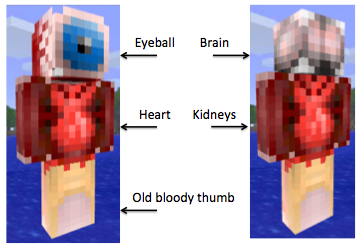 Transplant is composed of an eyeball, a brain, a heart, a pair of kidneys, and a severed thumb.